What if an arena ride had the effect of a massage for a horse? Wouldn’t the rider feel great too? That was last week’s post and this week, I’ll share a recipe for that good ride. Phase 1: Walk on the buckle 10-15 minutes, no contact, allowing the horse to look around and warm up the joints. No dawdling, this is a forward, swinging walk. Phase 2: 10-15 minutes of stretching at the trot and canter, working 20 meter circles, with steady rhythm in transitions. Stay safe, but resist contact a while longer. Every snort or blow gets praise. Phase 3: Take a walk break again, about 5 minutes, on a long rein. Remember release=reward. Phase 4: The working phase is about 15 minutes. School at the level of your horse: Slowly pick up contact and start with transitions between gaits. Don’t over drill, give lots of walk breaks so the horse can relax and think about what he is learning. If he does a good job, quit this segment early. Phase 5: Cool down and stretch from a light posting trot down to a walk on the buckle- 10 minutes or so. It’s a simple recipe. I don’t think it has any ingredients that you wouldn’t already have in your cooking repertory. Actually, I borrowed the recipe from Dr. Reiner Klimke– it was his method for riding horses of any age or level. Then I added some spices of my own. But that’s the point, most riding sounds simple. But simple is not the same thing as easy, and sometimes following the steps doesn’t get the same result for every cook using the same recipe. With that in mind-I will give you a few cooking tips for your ride. First, remember you LOVE to cook. (Okay, this is all analogy, I hate to cook, but I do love to ride.) Attitude is everything for a successful ride, give positive cues and focus on the good parts. If we get into a routine of constantly correcting- that’s nagging, and we become a giant, but dull pain on our horse’s back. So cook/ride with patience and love, nurture your horse and ride with a happy seat. Use your timer, don’t guess when it’s done– in the oven or in the barn. Barn time is an altered state. Usually we lose time; we blink and hours have passed. Or we go too fast, meaning we rush ahead before our horse is fully warmed up. Go slow, literally look at a watch- 10 minutes is way longer than you think. If you ride to music, you can count songs, but discipline slowness. Let your horse tell you when he is ready. Be creative. You might need to change things up. 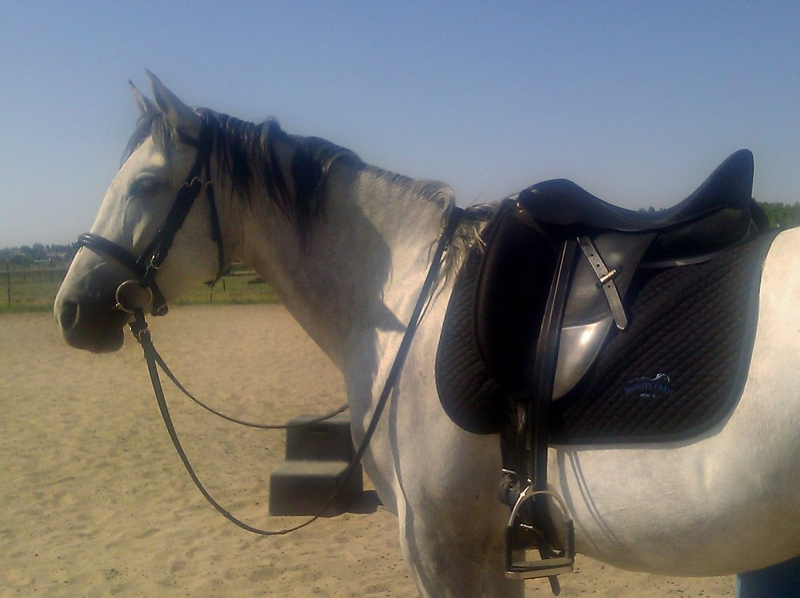 I am riding a young horse right now; she is energetic and can lose confidence on a long rein. So I negotiate with her, sometimes I need to cut the work into small bite-sized pieces so my horse can chew them thoroughly. If it doesn’t turn out, try again. If your horse needs to be bullied into work, its time to reevaluate. Make sure he is sound, and then try a different approach. Resistance only trains resistance. No substitutions. Forward is the answer. Balance, rhythm, and ultimately obedience, all come from fluid, forward movement. You are what you eat. Fast food can be fun, but a gourmet meal is art that lifts the horse/rider senses and nourishes the soul. Ride deliciously. Thank you Anna, a recipe to savour and digest at leisure 🙂 timely recommendations as I”ve just got back in the kitchen/saddle! Like to think of you over there, mounted up with knife and fork. Delicious!! Have been enjoying your blog – shared it with my niece. She is a stable hand, and dressage competitor. Always a good read. Thanks, Kris. She is a stable hand first and competitor second? Perfect, I would like your niece. Good priorities. Thanks for reading, I appreciate your blog as well. It’s refreshing. love your blogs! I really like “every snort and blow gets praise” such an easy thing to forget, but so important. Thanks for dropping by from across the sea. great article. What is “walking on the buckle”? Thanks for asking, walking on the buckle literally means one hand, on the buckle of the (english) reins. A long, draped rein, the way we leave the arena after a Dressage test. If that isn’t safe, a slack rein and long, soft arms. Thanks! This blog in particular; warm-up is so important. Thanks for reading, Barbara. Any tips? If I don’t rein in my Arabian, she will fly around the ring in her canter. How can I use your method of soft reins for warm-up and keep safe? I can’t say for sure without watching you… and the first thing to be certain of is her health. Could she have ulcers, does your saddle fit, truly. Is she sound? A horse that flies around the ring might be fearful, more than hot and I want to start by releasing her anxiety. Start with just a walk, nothing more. Go slow. When you do ask for a trot, just a few strides and bring her back. Reward her for DOWNWARD transitions. Go to the edge of her anxiety and stop pushing. Breathe with her. And know that if this is a habit with the two of you, it will take some time to change it. Good luck.